Geneva motor show 2012: Kia Cee'd SW | What Car? 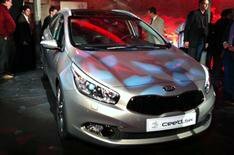 The new Kia Cee'd SW has been unveiled at the 2012 Geneva motor show. The SW is the estate version of the new Ceed goes on sale in September; the five-door hatchback version goes on sale in June. The new Cee'd SW is closely related to the new Hyundai i30 Tourer, which also makes its debut at the Geneva show and will go on sale at roughly the same time. Although the two cars share many mechanical parts - including engines - they look very different. The Cee'd SW gets a sleeker, more aggressive look than the current model; inside, there's a classier cabin, with a dashboard that wraps around the driver, a new touch-screen control system and lots of soft-touch materials. Full technical details are yet to be confirmed, but the Cee'd SW 528 litres with the rear seats in place: the hatchback has a 380-litre capacity. With the seats folded the Cee'd SW is likely to have a similar load capacity to the i30 Tourer, with a maximum of around 1642 litres. That compares with key rivals such as the Ford Focus Estate and Vauxhall Astra Sports Tourer. The Cee'd SW is expected to be offered with the same engine range as the hatchback, so there's likely to be three petrols and three diesels, with power outputs of between 94bhp and 133bhp. Prices won't be confirmed until May, but we'd expect an increase over the current car, with a starting point of just under 16,000.